Back in the early 2000’s there seemed to be a glut of “The” bands. You couldn’t turn on the radio without hearing from The Vines, The White Stripes, The Strokes, or The Hives. These bands were all part of something that was called the “Garage Revival” by some and at the time I found it a bit annoying, to be honest (the “The” part, not the music). Anyway, the parade of garage rock bands ended and rock went back to the underground. Thinking about it still kinda bums me out. I wish the Garage Revival of the early 00’s hadn’t been a fad; I wish the kids today really loved down-and-dirty rock. But here we are, a decade later, and all that’s left are the memories. The Vines are still kicking around, but it took them an extra year to release their latest album FUTURE PRIMITIVE here in the States (and no one bought it). The White Stripes have disbanded, crushed by the sheer brilliance and professional-ADD of Jack White and crippled by Meg’s stage fright. The Strokes recently got back together and cobbled together a new album, but I’m afraid they’re doing their best work in their solo albums at this juncture. So that just leaves The Hives. I remember thinking when VENI VIDI VICIOUS was first released that of all the “The” bands, The Hives were the weakest. Don’t get me wrong, I really liked “Hate To Say I Told You So,” but I just didn’t see any future for their aggressive brand of Swedish garage punk. And while VENI VIDI VICIOUS has some good moments (“Die, All Right!”, “Main Offender,” and the cover of “Find Another Girl”) I wasn’t bowed over by it. I thought we’d never hear from them again. In fact, to show you just how wrongheaded I was at the time (or just how much bands can surprise you) of all the groups I’ve just listed, I thought The Vines were going to have the biggest career (yes, even bigger than The White Stripes). Then in 2004 I was listening to Little Stevens Underground Garage radio program (while at work) and he dropped “Abra Cadaver” and “Dead Quote Olympics” upon my unsuspecting brain. 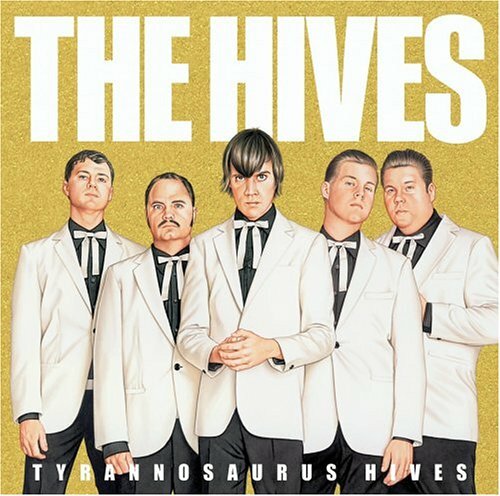 That year The Hives released TYRANNOSAURUS HIVES, which I still consider to this day to be the band’s best album. It was just like VENI VIDI VICIOUS but tight and more refined. It was weird, but less-European (no funny foreign-languages in the song titles). The longest song on that record is the single “Walk Idiot Walk” which just barely manages to clock in at 3:31. I love pretty much everything about TYRANNOSAURUS HIVES all the way down to the super ridiculous bolo ties the band sports on the album cover. 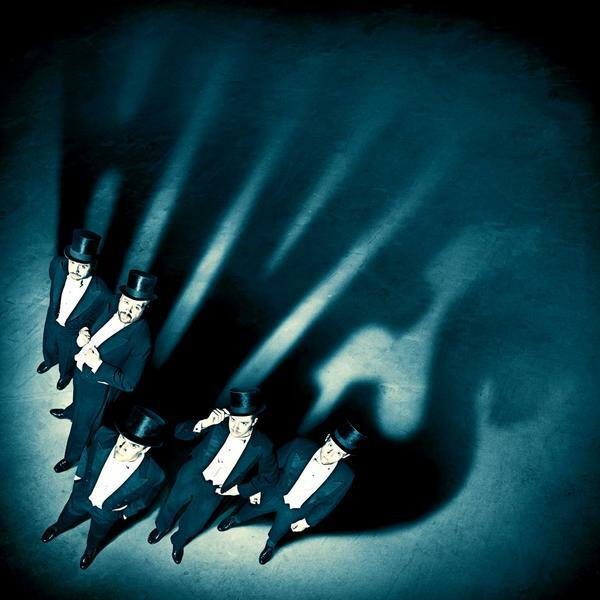 The Hives forumla is simple, but effective: guitar hook, stomping drum beat, shouty vocals, clap-clap. The band strayed a bit from that formula with their next release, the slightly gloomy THE BLACK AND WHITE ALBUM. I think TBAWA is pretty good record and there are a lot of “classic Hives” elements on it (the single “Tick Tick Boom” and “Try It Again”) but the band also branched out into some interesting new directions with mixed results. They had a bunch of new producers (including most famously Pharrell Williams of The Neptunes-fame) which resulted in an overall feel that was slightly less-than Hives. Don’t get me wrong, I think songs like “T.H.E.H.I.V.E.S.” and “Puppet On A String” are really interesting but I missed the basic “shouty-shouty-handclap” of TYRANNOSAURUS HIVES. TBAWA came out in 2007 and thanks to “Tick Tick Boom” The Hives were back in the spotlight (well, the song appeared not on the radio so much as in commercials and films). I never forgot about The Hives but I had no idea that they were releasing a new album until my enlightened fellow rock-nerd blogganaire over at LP on 45 wrote about how he was seeing the band live (in support of a NEW album!). The Hives, looking dapper as always. So, with the blind faith only a true fan can have…I pre-ordered LEX HIVES and two days later it was released. So how does it stack up to the rest of The Hives oeuvre? I think LEX HIVES is a “return to form” album. I dont’ think THE BLACK AND WHITE ALBUM was a mistake, but I think the band decided to move back more to the straight-out garage punk sound that made them famous. Some of the reviews I’ve read are a bit negative, saying the album is nothing but a throw-back (a charge critics have been lobbing at The Hives and just about everyone else in the Garage Revival since the very beginning) to that criticism I can only say: I know it’s a throw-back, isn’t it wonderful? I’m not sure what sort of strange space-music these critics think we should all be listening to, but what The Hives are is a great, fun rock band. Overall, LEX HIVES is a great record that makes me want more from a band I hadn’t thought of in a while: the album is full of awesome hooks and plenty of “shouty-shouty-handclap.” I am satisfied.